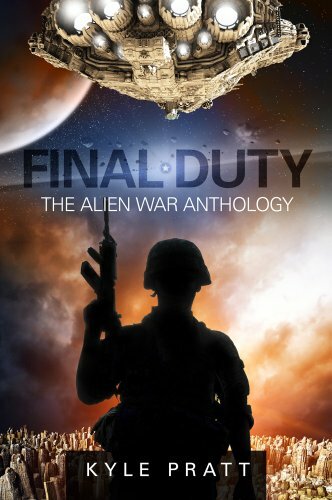 My second book Final Duty – the Alien War Anthology is now available on Kindle. The anthology takes its name from the novella, Final Duty, a 15,000 word story that leads off the book. In that story, Lieutenant Amy Palmer returns to the Altair star system as an officer aboard the reconnaissance ship Mirage twenty years after the death of her father during the Battle of Altair, Almost immediately disaster strikes and Amy, along with the crew of the Mirage, must face the possibility of performing their final duties. I wrote most of Final Duty while serving on the U.S.S. Missouri (BB-63) during the Gulf War. I’m certain writing this story while living in the confined grayness of a navy ship during combat gives the story an added sense of realism. While writing it I tried to take current military procedures and imagine them in a future spacefaring navy. Also in the anthology is The Promise, a 5,000 word short story. In this tale, a young man is about to leave the planet of his birth with his wife and child, but his mother refuses to go until they visit an isolated war memorial. It is there that his long dead father fulfills his final promise. The Promise includes a tale told in flashback within the structure of the main story. Today, they tell writers not to do flashbacks, but I didn’t know that at the time I wrote the story and, regardless, I think it works. The Promise was written before Final Duty, while I was on deployment with the USS Sterett (CG-31) in the western Pacific and, I believe, it was also helped by the fact that I was onboard a navy ship at the time. While it was my first venture into the military science fiction genre there is also a bit of romance. At just over 5,000 words, it is the shortest story in this anthology. The last tale in the anthology is the 6,000 word short story, Infinite Darkness. In this story a young man wakes up and discovers he is the new guy in an army unit on an alien world. This story is also solidly in the military science fiction genre and in the same universe as the first two stories. While the previous tales were naval, this story uses a loop literary technique to examine one day in the life of a soldier caught in combat on an alien world. I quizzed my youngest son, an Army veteran, for procedural details while writing it. I hope you enjoy all of the stories in Final Duty. I’m currently working on an unnamed full-length novel about life in the United States after a series of terrorist nuclear attacks. It is scheduled for release later this year.